Parklane has a great location in Greenlane/Epsom -we are the closest accommodation provider for Auckland (ASB) Showgrounds/EXPO centre and Alexandra Raceway - we are DIRECTLY OPPOSITE!! Right next door to Greenlane Medical clinic, and just 4km to Auckland CBD, 6km to St Lukes, 9km to Western Springs and the zoo, 4km to Dressmart and 11 km to the airport. Cornwall Park is a short stroll away, great for that early morning walk or jog & Ellerslie just over 1km away. We are a Qualmark 4 star motel, with 38 spacious and comfortable rooms, most with balconies and some with views of the swimming pool. Choose from a Standard Studio, Twin-share Studio, Executive Spa Studio or a unique Penthouse Spa Studio.
. The Penthouse Spa Studios are exceptionally large rooms, with air-conditioning, ceiling fan, plunger coffee and spa baths, King-size beds and 2 balconies, including a large, private terrace with mosaic patterned table and chairs. We are an ideal place for a longer stay - we have a large swimming pool & children's splash-pool, guest laundry, internet desk, breakfast room, ''Heat and Eat'' evening meals available and free ample off-street car parking. There are many great cafes and restaurants a short stroll away, a large supermarket nearby, and the bus stop to Auckland city centre is just a 2 minute walk away. Highchairs and porta-cots available on request. 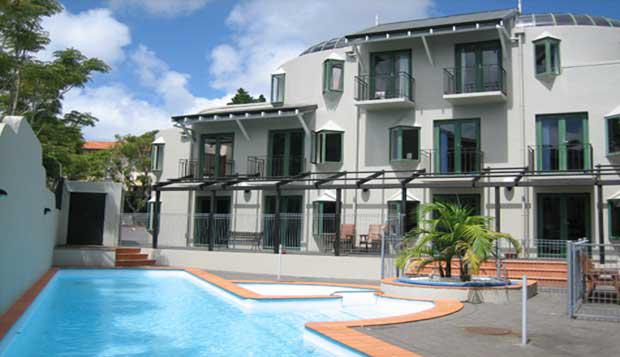 We are the closest accommodation provider to the Auckland (ASB) Showgrounds. The Greenlane shops are the main shopping centre for the suburb of Epsom and are situated at the intersection of Manukau Road and Green Lane West. On the Northern side of Green Lane are located the Alexandra Park Raceway and the Epsom Showgrounds; on the southern side is Greenlane Hospital, Cornwall Park, and One Tree Hill Domain. The Greenlane shops developed during the 20th century servicing the needs of the local community as well as the visitors to the Raceway, Showgrounds, Hospital, and parks. There was also a Tramway terminal located here from 1902 until 1956. The make up of the local businesses have changed over the years; currently Greenlane is a centre for the antiques trade as well as being the location of a good selection of restaurants and bars. The 1920s Lido Cinema still operates, one of the few stand alone suburban cinemas to do so. The area is served by good State secondary schools including Auckland Grammar School, Epsom Girls Grammar School and St Peter's College. Parklane Motor Lodge is a large motel with 38 studio-style rooms. We are superbly located directly across the road from Auckland (ASB) Showgrounds and Alexandra Raceway and just 10 minutes drive to Auckland CBD and just 15 minutes from Auckland International Airport. We have a large Swimming Pool, Mini-gym and Breakfast Room open daily. All Rooms are well equipped with a Kitchenette (Microwave, Fridge, Toaster, Tea/Coffee making facilities & Stove top cooking hob), Freeview TV + Sky Movies and Sports, Mini-bar, Iron & Ironing board, Hairdryer, Clock/radio and wireless Internet Access. Most rooms have balconies. •	Standard Studio – A comfortable room with a Queen-size bed and Ensuite. •	Twin-share Studio – A comfortable room with a Queen-size and a Single bed sleeping up to 3 people and Ensuite •	Executive Spa Studio – Spacious room with a King-size bed and Ensuite with shower over a Spa Bath . •	Penthouse Spa Studio – Very large and uniquely designed room with a King or Super-King size bed, Sofa, Air-conditioning, Large private Balcony, Skylight & Ensuite with a Shower and a Spa Bath. •	Family Penthouse Spa Studio – Very large and uniquely designed room with a King or Queen Bed + 3 Single Beds, Air-conditioning, Large private Balcony, Skylight & Ensuite with a Shower and a Spa Bath. To compliment our accommodation we have an air-conditioned Conference Room ideal for those executive meetings, product training, group discussions etc. The Mayfair Room caters for up to 20 people boardroom style or 40 people theatre style. The room is ideal for conferences & business meetings, as well as many other purposes. Catering for morning and afternoon teas, and lunch or snacks can be arranged. •	Auckland Airport – 15km •	Auckland CBD – 6km •	Auckland (ASB) Showgrounds & Alexandra Raceway – Directly opposite •	Ellerslie/Penrose – 3km •	Greenlane Medical Clinic & Cornwall Park – Next door •	Mount Eden - 4km •	Mount Wellington – 7km •	St Lukes – 6km •	Western Springs – 7km •	Dressmart – 4km •	Selection of Restaurants – a short stroll! !